Can you identify any of the dancers in this photograph? A black and white large format of the Junior Theatre performing "A Cobbler in Fairyland". In this view five dancers are on stage. 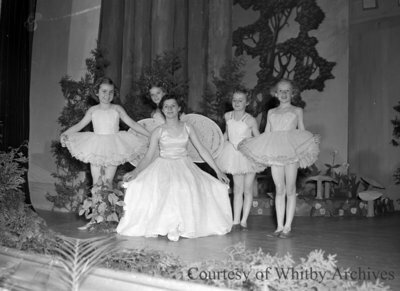 Junior Theatre, May 28, 1949, Marjorie Ruddy. Whitby Archives A2013_040_343.